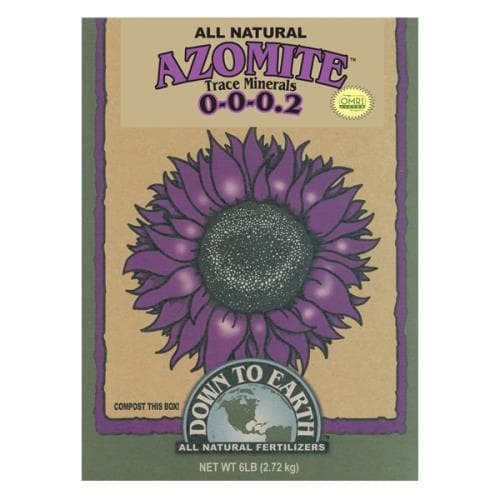 Down To Earth™ AZOMITE®, the “A to Z Of Minerals Including Trace Elements,” is a natural trace mineral product formed from the dust of an ancient volcano in central Utah. DTE™ AZOMITE® can improve root system growth, crop yields, quality and flavors. The slow-release format is virtually dust-free and spreads easily on fields, garden soils and lawns or can be blended with other fertilizer materials as a trace mineral resource to help meet plant nutritional needs. It can be applied directly or in combination with composts, fertilizers, manures or soil inoculants. Slow-Release grade of Azomite™ volcanic minerals with particle sizes ranging from 4 to 200 mesh. Ideal for blending with other fertilizer materials and amendments as a trace mineral resource to help meet complete plant nutritional needs. An economical way to fortify and re-mineralize soils, composts and potting mediums.